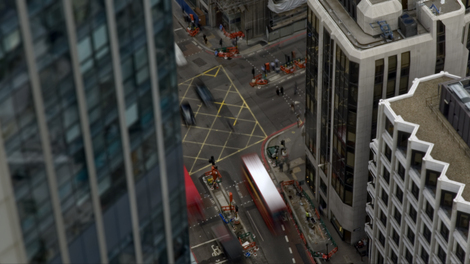 Co-produced by BBC Radio 4 and Film London Artists' Moving Image Network, The City Speaks: A Film for Radio, is a multi-faceted portrayal of London created for radio, cinema and television. Taking as its starting point an anticipated apparition of the Virgin Mary, the film portrays London through an array of images and locations: a heart in a fridge, a synchronised swimming team, Caribbean mythical figures, East End cafes, markets and a non-existent underground station. The commissioned artist /writer pairings were: William Raban and Alison Joseph; Alnoor Dewshi and Lin Coghlan; Sam Brady and Nick Warburton, Joe King & Rosie Pedlow and Mike Walker; Inge 'Campbell' Blackman and Mark Norfolk; Esther Johnson and Mehrdad Seyf. Artist film-makers were commissioned to collaborate with radio writers to produce a unique portrait of London. Responding to a narrative framework by writer Peter Ackroyd, the artist and writer teams created a film in six sections. The City Speaks premiered at BFI Southbank, in March 2008 and was subsequently broadcast on BBC Radio 4 in two parts on the 19 and 20 March 2008. Allowing audiences to watch as well as listen, by pressing the red button from any BBC TV channel. The City Speaks was also screened nationally on BBC Big Screens in city centres across the UK. Visit the BBC website to read Peter Ackroyd's original story.